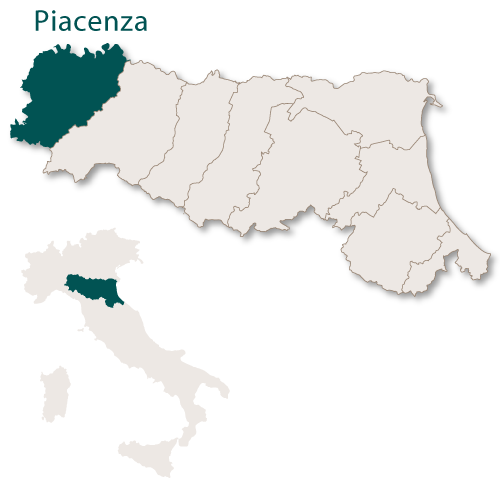 Piacenza is the most westerly of the provinces of Emilia Romagna and lying just south of the River Po it has a total area of 2,589 sq.km. 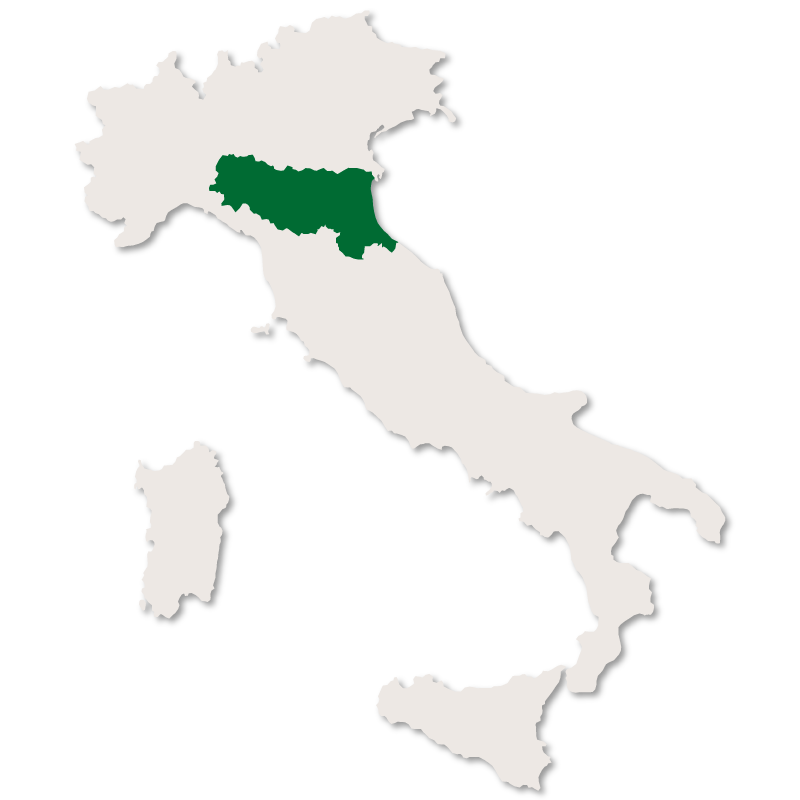 It borders the province of Parma to the east and south east, the region of Liguria to the south and the region of Lombardy to the west and north. 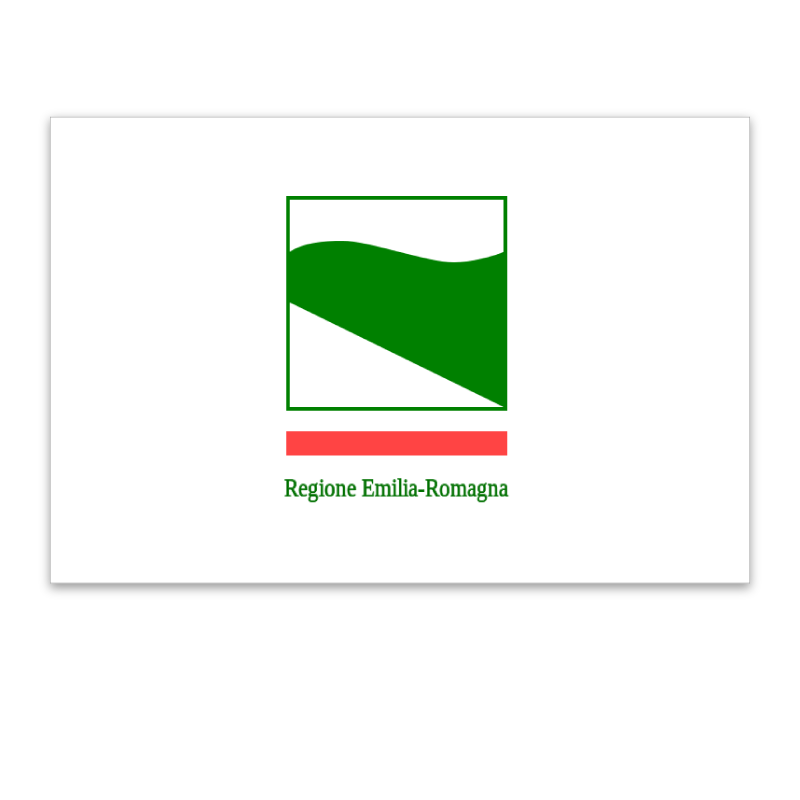 Two thirds of this province is mountainous with the remaining third being green and fertile with a network of rivers running through the plains which are backed by craggy spurs and rounded hills covered in vineyards. The small medieval villages dotted across the landscape are dominated by castles, towers, church spires and large, solid fortresses. The capital city of the province is also called Piacenza and has a large number of historical palaces, most of which also have large, splendid gardens. Palazzo Comunale was built in 1281 and was originally the town hall and on the front face has five arches which are made from pink marble on the lower part and bricks on the upper portion. It is mainly used now for conferences and lectures. Palazzo Farnese was built in 1568 for Ottavio Farnese and his wife, Margaret of Austria. Palazzo Landi was built during the middle ages but was heavily renovated in the late 15th century. Palazzo Scotti which now houses the Natural History Museum. Palazzo dei Mercanti, built in the 17th century and is the current town hall. The Duomo di Piacenza was built in the 12th century and is a very good example of Northern-Italian Romanesque architecture. The façade is made from Veronese pink marble and gilted stone and is divided by a gallery that dominates the three gates. The church of San Francesco Church is a 12th century Romanesque/Gothic building which was a civic sanctuary during the Middle Ages. 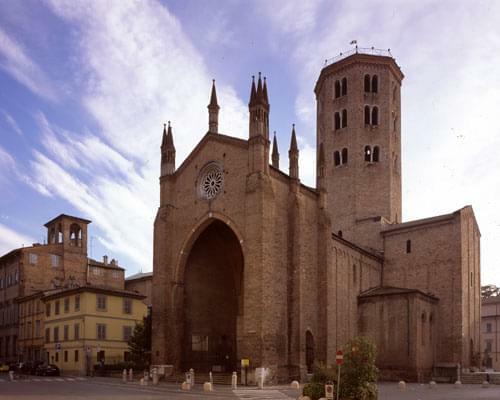 The Basilica of Sant'Antonino is a fine example of Romanesque architecture and has a large octagonal tower. It built in the year 375 and contains the relics of Saint Antonio who was martyred near Travo. Building began on the Basilica of San Savino in the year 903 but it was not actually consecrated until 1107. Santa Maria in Campagna 1s a Renaissance church and was built between 1522–1528 to house a miraculous wooden sculpture of the Madonna. The layout was originally in a central Greek-cross plan, but later altered into a Latin cross type. St Sixtus is a Renaissance church built in the 15th century over the top of a temple built in 874 by Empress Angilberga. Ricci Oddi Gallery is an art-gallery dedicated to modern Italian painters. There is also an Archaeological Museum in the city. 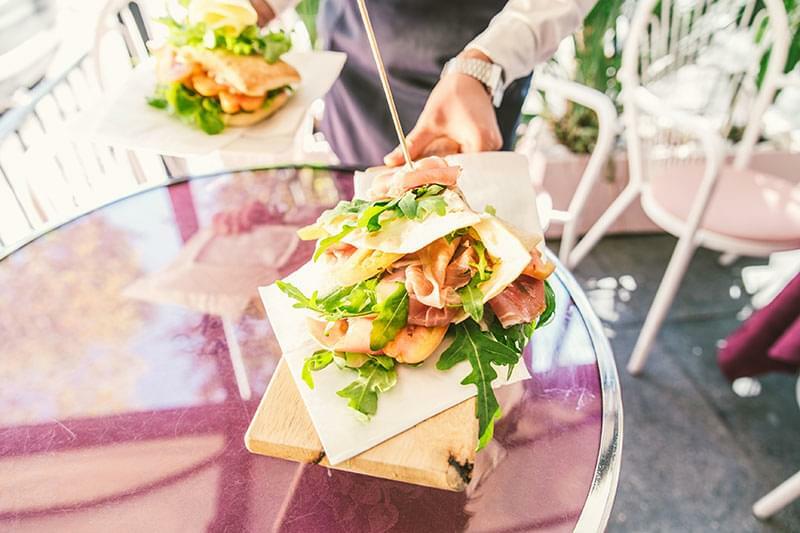 The main square of this historic little town is Piazza Bergamaschi where there are many bars and restaurants and a few shops. The main point of interest is the 12th century castle which is just behind the square. Bobbio is a town right in the heart of the Val Trebba valley which was declared by Ernest Hemingway to be 'the most beautiful in the world.' The historic centre of the town is called The Castellaro and is just below the castle and park. The town centres around the pretty Piazza del Duomo which is flanked by ancient arcades and historic buildings. The Cathedral (Duomo di Bobbio)) was built in 1075 and has two magnificent towers which are in the most part still the originals. To the right of the cathedral is the Palazzo Vescovile (Bishop's Palace) which was built in the 11th century. 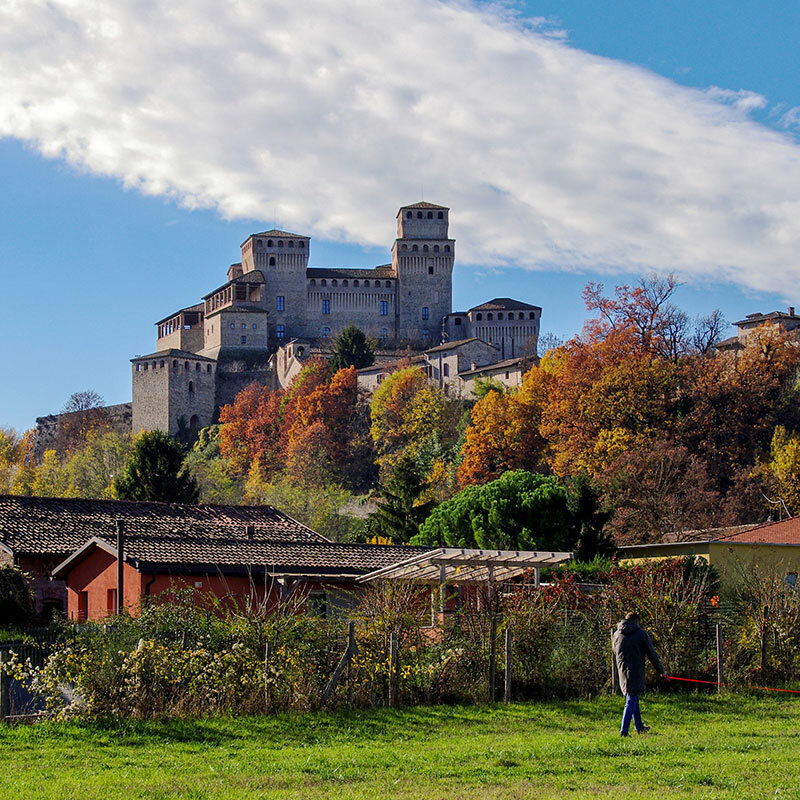 On the left side is the 12th century Old Seminary which houses the Bobbio Historical Archives. There are parchments and fragments of ancient codes dating back as far as the 9th century in this building. 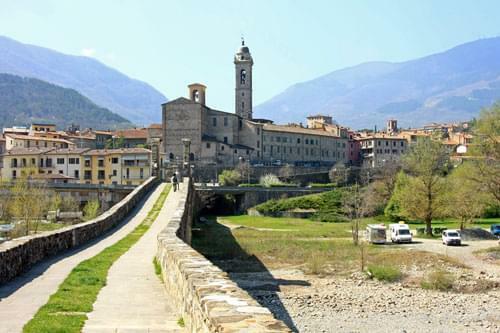 Bobbio Abbey has recently been restored and is open to the public. 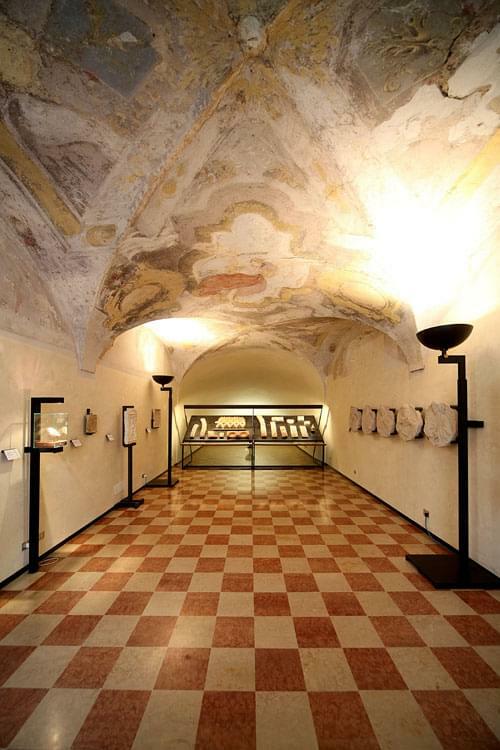 It also has a museum with interesting objects from the Roman, Medieval and Renaissance ages. Sant Columbanus Basilica was built between the years 1456 and 1522 over the remains of a 10th century Romanesque church. Malaspina-dal-Verme castle which was constructed in 1304 sits on top of a hill overlooking the town. From here you can get an excellent panorormic view over the whole of Bobbio. Piazza San Franceso is very pleasant with gardens, a fountain and a war memorial. Three more religious buildings worthy of a mention are the Monastero e Chiesa di San Francesco, the church of San Lorenzo and the Santuario della Madonna dell'Aiuto. The old town here is wonderful, built high on a rock the medieval centre is well preserved and is little changed from how it was in the 10th century. Because of its charming medieval structure it is a popular location for TV programmes and movies, the most notable being 'Ladyhawke'. The castle, Rocca Viscontea, is square with square with four square towers, a keep and a moat with two entrances. Within its walls is a Medieval Musuem. Collegiata church of St Mary dating back to the 8th century but had to be rebuilt after the devasting earthquake of 1117. Palazzo del Duca built in 1292 and connected to the Torrione Farnese by a tunnel.